Taher E. Jehaimi has been Minister of Planning, GNA, since 2016. Previously he used to be the governor of the Central Bank (Libya). From 2009 to 2011 he served as Ambassador to the People’s Republic of China. 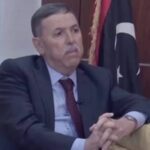 He was Minister of Planning (2003-2008); President of The Higher Planning Council (2001-2003); Governor of the Central Bank of Libya, the International Monetary fund, and Alternate Governor for the World Bank (1996-2001). He was Chairman of UBAE Arab Italian Bank (1997-2001), and Director, Banca di Roma (1999-2001); Member of the Advisory Board, Regional Bureau of Arab States, UNDP (2001-2003); Minister of Trade and Economy (1994-1996); Director General of the National Academy of Scientific Research; Member of the Commission on Science and Technology (UN Economic and Social Council). Mr. Jehaimi taught Economics, Energy Economics, and International Finance at the University of Garyounis in Benghazi, the University of Colorado, and the University of Utah. He has represented Libya on the UN’s Commission on Sustainable Development.